Hello! My name is Mitch, and I write primarily in the style(s) of the eighteenth century. I believe that it is the notes, not just the instruments, that put music within a certain style or genre. 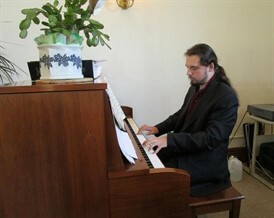 I am an organist and harpsichordist as well, and although I primarily write for keyboard I'm expanding my abilities. I'm more than aware that being a 'Baroque composer' is mostly impossible, as the era has past. I'm aware that there may not even be a market for such music nowadays, but despite this I continue to write. My music is available for all those who wish to learn and perform, and above all, appreciate. I am still a student, so I welcome anything else I can learn as well.